Top floor, corner condo on left. Ocean view from living room. Large couches and flat screen TV in living room. Large mirrors help reflect the ocean view. Pull out sleeper sofa in living room. Dining room area, seating for 6. View of ocean from dining room table. View from dining room area to living room. Large kitchen with modern appliances. Master bedroom, king size sleigh bed. Master bathroom with large jetted soaker tub. Flat screen TV in guest bedroom. Enjoy this top floor oceanfront unit with spectacular views! Complimented with oversized mirrors on the backdrop wall you are surrounded with the drama of breaking waves. Recently upgrading furnishings include new oversized couch and loveseat, King size bed, flat screen TV, HD premium cable TV channels, and new master bedroom furniture including Memory Foam mattress. Guests frequently comment this condo "far exceeded our expectations" and offered "breathtaking views". One guest summed it up best, "We have been here eight times and can't wait to come back to 634!" Please browse our guest book for more and add your own thoughts about our home. Rain or shine, you'll never be disappointed. We had a wonderful time at the coast for the weekend. Unit 634 was perfect for our family of three plus the dog with plenty of room to stretch out on the huge couch while we watched movies. The beds were very comfortable and since we took numerous walks on the beach each day they were just right for a perfect nights rest. We will book again for sure. Great place to spend the weekend or longer! View from condo is amazing, close access to the beach, beautifully decorated and very clean. Thanks for a great weekend! Another fabulous stay in 634! Had a wonderful Christmas stay in condo 634. Condo had everything we needed to host Christmas dinner. The views never disappoint and the comfort of this condo is outstanding. We have stayed several times at Vacations by the Sea, three of those were in this condo and it's our favorite one. Pet friendly as well! Thanks for staying with us again and we're thrilled to hear you've found your home away from home with us in this condo! Happy New Year! Definitely worth It! Highly recommended! Loved our stay over Thanksgiving week! Beautiful condo and spectacular views! My wife and I were very satisfied with our experience. we had our grand kids with us and we all enjoyed the beautiful condo and the surrounding area. The condo was beautiful. Enjoyed every minute. Breathtaking view, spacious living space, and perfect amenities for every family member to enjoy. We’ve been coming to these rental condos for several years now. The units are very nice and fully equipped. We love the dog friendly policy too. The ocean front views are the best. It’s so relaxing and the fact that you only have to throw a few things in your bag makes the trip even better. 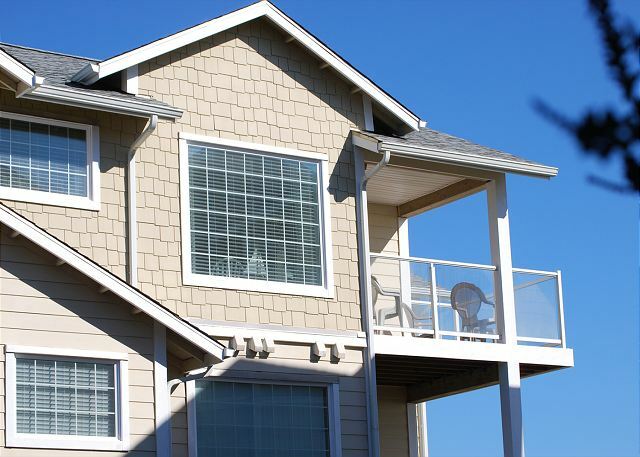 We enjoy the getaways here and appreciate the care and upkeep that goes into maintaining the condos. 4 stars! My family and I are in love with Westport. We started coming last year to celebrate my mom’s birthday and Mother’s Day. The weather was perfect that weekend and even though there were a lot of people staying in the condos. We never felt like we were crowded. It was a wonderful trip and we will be back next year. We might even stay one more day. Love these condos. Have stayed in this particular one twice, it’s oue favorite! High ceilings and amazing views of the beach. Highly recommend! We can always rely upon the units at Vacations by the Sea This is our second time staying in 634 - a great top floor dog friendly unit. Would stay there again in a heartbeat. Comfy furnishings, gorgeous view. We'll definitely rent this place again. This is or 4th stay at this unit and we love it! Perfect location, clean rooms, comfortable furniture, everything you need home away from home. Everytime we stay here, we are amazed at th beauty. It's a wonderful place to stay and truely relaxing. It continues to be a pleasure each stay. Our weekend stay at this condo was everything we could have hoped for. Unit 634 has breathtaking views that go forever. Everything in the condo was fresh and immaculate and we couldn't believe how well equipped it was. We couldn't believe that there was even a kite to play with! Our 3 year old grandson had such fun discovering the joys of a trip to the oceanside. He is still talking about how "his" sandbar island had little "rivers" you had to cross and how he watched from the condo as it appeared and disappeared with the tides. Memories we will always treasure! We can't wait to come back and stay at Unit 634 again! Thank you for a great trip! 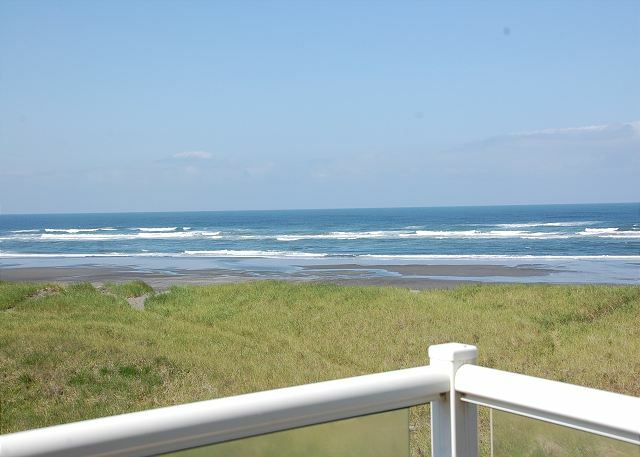 We have visited Westport for the last 7 years and always stay in the Vacations By The Sea condos. This year was our first year to stay in 634 and we were thrilled with the condo itself (large and roomy and very clean and tidy) and the view was amazing!!! My husband and I and our two small children felt right at home and enjoyed a lovely relaxing week. Also, the management company was extremely friendly and professional (as always. We will definitely be back next year. The best time! There were 5 of us and we had a wonderful time. Lovely unit, great view would do it again. Almost indescribable, fantastic view, more than enough room for the whole family, convenient, easy beach access, comfortable beds. Clean, well maintained unit. Having the elevator was great. Had dinner in downtown on Friday night at Aloha Alabama BBQ - yummy. Second night dinner was in and we feasted on fresh - from float 8 seafood. I have and will continue to recommend VBTS. We were just in town one night for a wedding, but would definitely like to come back for longer. The condo is great! Well furnished very comfortable bed and great views. Very spacious. We had a wonderful visit to the sea in this comfortable and beautiful condo. What a beautiful condo. Lovely view. Only recommendation is a cart for getting all our gear up to the top floor. Thanks for the kind words about the condo and we're glad you enjoyed your stay. We will be sure to pass on your suggestion to the property owner about a cart for the building to help owners and guests with gear to the condos. We enjoyed our stay so much that we extended it. This unit has a fantastic ocean view, modern and very comfortable furnishings with everything needed for an extended vacation for a family of 5. Nice location on the beach. Nice condo community with pool, hot tub, and fitness center. Stayed for four days during Christmas and this place was better than expected. Must have collected 100 sand dollars on the beach! A lovely condo with a fantastic view. We typically share this condo with another couple which makes the price quite reasonable. Nice condo with a fantastic southwest facing ocean view. Furniture/beds were in very good shape for a pet friendly rental condo. Plenty of room for our family of five plus the dog. Grounds are well maintained and include a pool, putting green, playground, and community grills. 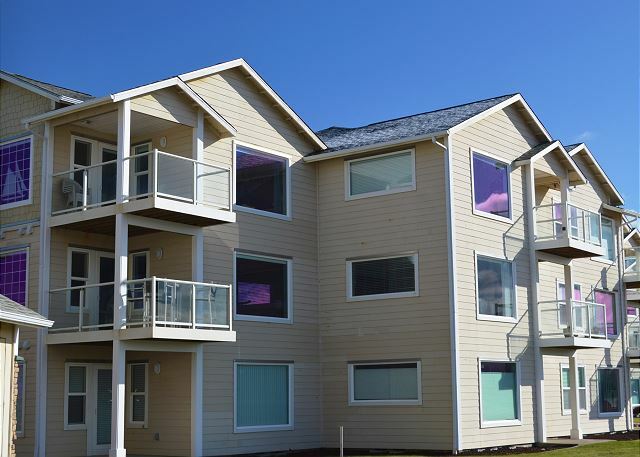 Condo is steps to the beach and a beautiful oceanfront dune path. Easy drive to Westport Marina area or two mile walk/bike ride up the dune path. The only downside I can think of is the sunset view (at least in the summer) was blocked by the neighboring building. We would definitely stay in this unit again. We had a lovely time in Westport and found this condo to be very comfortable. Everything was clean, adequate cooking utensils/pans/dishes, beautiful view and easy beach access. I highly recommend keeping a box of baking soda in the fridge, though, to absorb odors. That was my only complaint when we arrived--you couldn't open the fridge without the odor escaping. Rental condo was more than expected .... Just perfect for the family and dog friendly. We were very impressed with the condo and the view and all the surroundings ! Our grown children own a condo in this complex so it was a natural to rent here for a family reunion. It was everything I wanted and more. Thank you! My sister and I enjoyed our stay. The view was wonderful, unit was clean but could have used more than one black wash cloth. Property was so quiet and really liked that aspect. Already planning trip back next year but will bring the dog Olivia. Thanks for staying and we're thrilled to hear you enjoyed the condo. We place a black wash cloth for make-up removal in each of the bathrooms (2) and there is usually another one or two with the extra white towels in the master bathroom. This is a pet friendly condo so we welcome you and Olivia to visit again next year! Overall very nice place. There was no extra garbage sacks or hand soap at the kitchen sink, bring your own. The admin office is miles away and closed in the evenings, no room service here. We enjoyed our stay at #634 very much.The view is wonderful, the condo decor is very nice. The bed is great and everything clean. The only thing we couldn't find was a dish cloth. The fireplace makes a loud noise and needs to be fixed. Otherwise, everything was provided. We liked the quiet and almost private beach while we were there. We would recommend this unit to anyone. If we ever are back in the area, we will stay again. Thanks for staying and glad to hear you enjoyed our wide open beach! We provide dish towels for drying dishes if needed but use blue sponges instead of dish clothes in the condos. We will certainly look into the fireplace to resolve any issue. If you ever find you need something during your stay please let us know. Recently immigrated from another country. Growing up at the coast in my home country I was very curious to experience the west coast of the US. I really loved the condo we stayed in. It had a beautiful view of the sea and it was really nice and cozy inside and really well furbished. Would definitely return sometime in the future. We always love coming to the VBTS Condos. The condos are so refreshing with great views. We go 2 to 3 time each summer. We are planning to go for a week in July if we can get the time booked. Condo 634 is a beautiful suite to stay in. Close to the walking path, Westport light house and the club house and pool. The unit was fresh and clean, had everything we needed for a comfortable stay including salt and pepper! We will definitely be staying in this condo again! Made a last minute reservation for Easter weekend. This was our third or fourth stay in Westport and this was by far the best unit! The master bed was super comfy and as was the couch. The building also has an elevater which not all the buildings do so that's a plus. The room had everything we could ask for especially the awesome view of the ocean. Thank you for a wonderful stay. We will for sure rent this unit again. Stayed here over a stormy November weekend. Everything was perfect. Usually dog friendly accommodations are a little worn, but this was extremely clean. So glad to be able to bring our kiddo and our dog somewhere nice. A much needed and fun stay. The condo was amazing. The view was priceless. Had a great time. We will be coming back soon. Great times! Lovely location and beautiful views! This was a very nice, clean condo with great ocean views. Had everything we needed for our stay. We will come again! Dreamy end of summer retreat! We love unit #634! The decor has been updated, everything is clean and ship shape, and we just relax as soon as we walk through the door! The towels are plentiful, the new master king sized bed is amazing, , and the view cannot be matched. Just gorgeous! Our first stay in this unit was in 2012, and after 3 years, we are determined to come back every year from now on! We had a group of four families join us at the beach for a weekend getaway. Two families each shared one condo at Vacations by the Sea. Our condo was this one (#634) and we had four kids all under three with us. We were so happy with how clean it was (totally comfortable with babies crawling on the floor), the space we had to spread out, the close-up view of the ocean (you're steps away from the beach!) and the amenities it offered. I highly recommend staying here! We spent four days with two of my granddaughters and two of their friends. An August ritual for the past 3 years. Second stay in 634 and it is my favorite. Nicely equipped kitchen and very comfortable king size bed. The weather cooperated, too. Our stay at #634 was great! So nice to have the dog stay with us and enjoy the beach, the condo was spacious and had everything we needed. Our second time to use this condo. We had a blast with our family. They loved it all! Our unit was situated in the PERFECT location. We had easy access to the clubhouse and the beach. We watched whales from the living room window. The unit is appointed beautifully and with all the comforts of home. Anything you could possibly need for cooking was there. We rented the unit to spend time with my daughter and her boyfriend. It was a very special weekend. The comfort, location and amenities are enough to make me rent this specific unit again. 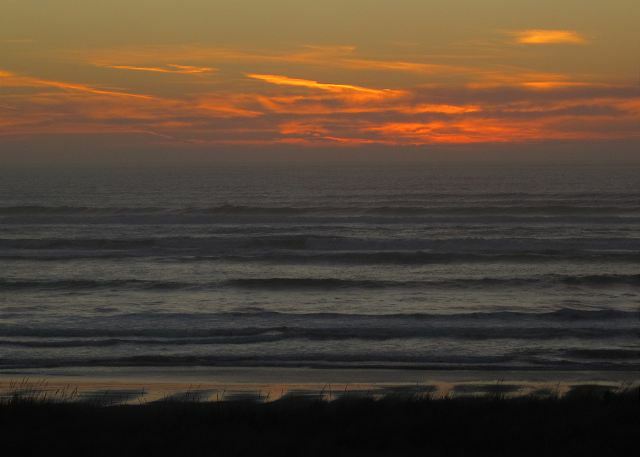 And, despite the weather reports of rain and clouds, we had beautiful sunshine and gorgeous sunsets. It was perfect. Have been coming to this property for over 10 years. This the first time we stayed at this unit. It was a very nice unit with a beautiful view. The only downside to this particular unit was that even though the view was great, we could not see the sunset from the unit. Thanks for staying and wonderful to hear you enjoyed this condo for the first time. This condo is ideal for sunsets in the fall, winter, and spring since the sunset is further north on the horizon during the summer. You will be guaranteed spectacular sunsets then! This condo is wonderful, it's beautifully furnished, clean and well maintained. It felt like home. 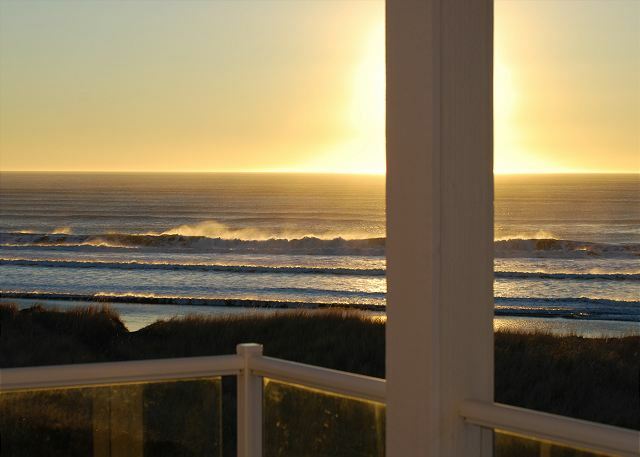 The ocean view from the living room and deck is breathtaking. The master has a king bed with a wonderful memory foam mattress, I slept like a baby. The kitchen has all the things of home if you like to do a little cooking. The master bath has a jacuzzi tub that we loved. It also has movies, music, board games which we all used. The beach has a short trail down to it and was easy to access. Our dogs had a blast playing in the surf. You are within walking distance to the Westport lighthouse and the Odysseus Restaurant which serves the best authentic Greek and Seafood you will ever eat. The kids loved the pool which was very clean. Overall this is the best condo we've ever stayed in along the coast. This was a very fun filled Family Vacation. I highly recommend it to anyone who wants the comforts of home while on vacation. You won't be disappointed. Took the family for a fun weekend. Gorgeous views, beautifully decorated and clean. Fun time swimming. Easy checkin and checkout. Family had fun fishing and caught lots of halibut. This is a great unit in a wonderful location--one of the few we've located in this area where you actually look out at the sea. It's well furnished and equipped, and the 4 of us enjoyed a great 5day stay. Even the weather, which was forecasted to be grim, worked out happily. My teenage sons and I needed a quiet getaway, that is what we received. Perfect view, awesome ocean rumble, short walk to the beach and was clean . One word PERFECT. We had a really nice time. The condo was beautiful and spacious. The weather even cooperated with beautiful sunny afternoons. Perfect for walks on the beach. We loved our stay in this condo! The view is beautiful and relaxing. The condo is lovely and everything you need is provided. Hats off to the owner for all the special touches and allowing our dog to join us on our getaway. We are already talking about coming back. Lovely and clean pet friendly condo - looking forward to returning to this quiet condo community. Enjoyed our first vacation at Westport by the Sea. The condo complex is quiet and immaculately landscaped. Condo #634 is furnished with comfortable furniture and is very clean, especially considering it is pet friendly. Our dog also enjoyed the views from the balcony and picture window. Wi-Fi worked seamlessly as did cell phone reception. Thanks for giving us a try and we're thrilled to hear your first stay was so fantastic! I see you already booked again for February so we'll see you then! Great unit with lots of room and a wonderful view. This property exceeded our expectations! The online description and pictures were completely accurate in depicting the unit we chose; the view was unreal! We had never traveled with our dog before, so I wasn't sure what to expect in the way of a "dog friendly" unity, but I was really amazed with the cleanliness and quality of the furniture, carpet, rugs, floors. Expertly maintained, for sure. The town of Westport itself was very quiet, not much open in the way of attractions in the winter, but we did find a couple of nice restaurants to dine at. Staying warm and cozy in the condo was our favorite! Short walk to be literally on the beach was a plus! The grounds at the condo were well taken care of, as well; very clean and attractive. We will most definitely come back to this location for family fun...and would request this particular unit again. Thanks for staying and we're very happy to hear you had such a wonderful first experience traveling with your dog. Our staff tries very hard to make it so you can't tell our non pet friendly condos from our pet friendly condos and we appreciate you noticed. Westport is quiet in the winter but it also makes for a nice escape from the crowds. See you again soon! Fab time for 3 best friends meeting up at this wonderful condo right on the beach. The unit is beautifully furnished, clean, first rate. Needs more wine glasses through! With gorgeous weather and so much to do in the area it couldn't have been more perfect! Can't wait to return. Vacations by the Sea is so efficient and easy to work with when making reservations. Gets a big plus from me! real nice time to get away to. Walked in the door &was very happy, when we left all went well. Nice place! Beautiful view! Very clean. Comfy furniture and bed. I'm trying to think of something that it lacked and the only thing I can come up with is to bring your own foil, ziplocks etc. there was some Saran Wrap there, but would still bring your own if you might need it. I used the fitness center 3 times and loved it. So glad it was part of the package. Wifi worked great, though not at all in the master bedroom, but that wasnt a big deal to me. You're very close to the water and the sound is fabulous! I left the doors and windows open whenever I was in the room so I could hear it. Awesome!! I guess the one thing that would have made it even better would be to have the bedroom on the water side so I could've cracked the window open all night. What a perfect way to lull yourself to sleep! I would love to go back again! Perfect Condo - great weekend! We loved this condo. It accommodated 5 adults nicely. It had everything we needed and was very comfortable. Love the view and our dogs loved the deck. We hope to return with the grandkids someday - Thank you! The property was clean, very well appointed and the photos and description accurately reflected what we found on arrival. While we did not have a need to contact manager, reservations were easy and all handled online without difficulty. If travelling to Westport, this condo is a great place to stay. Very comfortable, pet friendly - everything we needed for our stay. We went fishing on the Tornado (Westport Charters) and caught our limit of salmon. Also caught sea bass and rock fish. They did a great job. Eat Westport Winery's restaurant - excellent! Marino's fish market will clean, fillet, vac-pack and freeze your catch. Awesome trip - we'll be back !!! My family has been coming to this condo complex for years and this one is the best by far. We truly enjoyed the comfy furniture and the amazing view. I am already planning our next family trip to the condo in the very near future. Third time using Vacation by the Sea. We keep using it because we are totally happy with our stays each time. What a way to relax. We hope to save up and stay again very soon. We stayed for 3 nights and really liked this appt. There was just a minor problem with the master bathroom sink stopper. The telescope was a plus was we got to view the moon two nights. I'm glad to hear you appreciated the extra personal touch the owners of this condo have made to make it welcoming to their guests. Thanks for letting us know about the sink stopper, we'll get it adjusted to avoid any future frustration. Gorgeous condo with an equally spectacular view! We will definitely be back! I liked the Vacations by the sea folks, on the property. The people I ran into in the clubhouse were anything but friendly, and shunned my dog. Thanks for staying with us and we hope you enjoyed the rest of your time at the beach. Vacations by the Sea has moved offsite and the clubhouse is staffed and managed by the Home Owners Association. Everyone in our office loves dogs so next time you visit stop by our Marina Office and bring your dog, we have treats! We were able to check in early, which was really greatbecause we had been on the beach digging clams. We were wet and cold and really happy to be able to get in to our condo early. We have stayed at Vacations By The Sea many times. Unit 634 is the nicest one we have rented thus far. Elegant furnishings and well apppointed kitchen, great bed linens, and the most comfortable bed we have ever slept in. Best views of the ocean! Thanks for staying and we're happy we could get you in a little early due to the morning clam dig. A new king size bed and furniture was just put in the master bedroom so we'll be sure to pass on to the owner your compliment. See you again soon. WE absolutely loved our 3rd floor condo. Wonderful view. It was very clean, and even had an elevator to help bring up our luggage etc. We would love to come and stay again. Too bad it rained; but that night we watched the whitecaps and the large waves. Our granddaughter loved having her own bedroom and bathroom. Condo decorated very nicely. Only dislike was the pet area. Too many prickers in that area and they stuck on the dog when she tried to walk around. Again, good time, good condo. Vacations by the Sea is the perfect place for my extended family to gather during the guys yearly fishing trip. Our group rented 4 condos so each family had their own space, however, we could get together for dinners, down at the beach or watching the kids at the pool. This was our second year of staying here and we would definitely stay again. Very nice facility and location is excellent. This was our second visit, and we will be back again. Great place to sleep 4 not 6! We had a lovely time, the view and the Condo was wonderful, with one exception – this unit should not be listed as being able to sleep 6 – the sofa bed that is in there is not sleepable. Broken partial plywood but not sufficient to cover the whole bed, thin mattress my guest had to utilize the cushions from the couches and even that was not adequate, they literally did not sleep for 3 nights – I was frankly very embarrassed. I'm glad that you and your guests had a lovely time with us in Westport. Happy to announce as of 3/1/14 the couch, loveseat, and beds (new king in master bedroom) were replaced by the new owner. Hope to see you again. Perfect location close to everything!!! 6- star service for a 3 star price. 634 was a fabulous location. The view of the ocean was A+. The The living room furniture was very nice and up to date. All in all, we loved our stay and would definitely recommend it to friends and family. 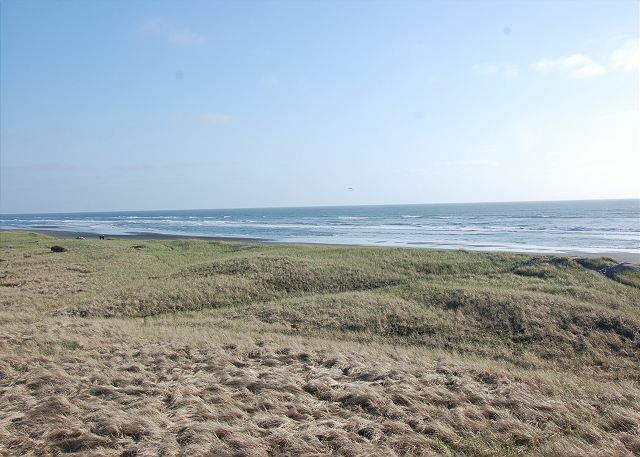 For razor clam digging in luxury, this is the place! Great escape to the beach for a winter weekend. This was a mother/daughter/granddaughter girls weekend, and we even brought the family dog. We needed handicap access because my mom uses a walker. This lovely 3rd floor view unit has elevator and convenient parking, even a stall shower with built in seat. The unit was clean, well equiped and I couldn't think of a thing that was missing. 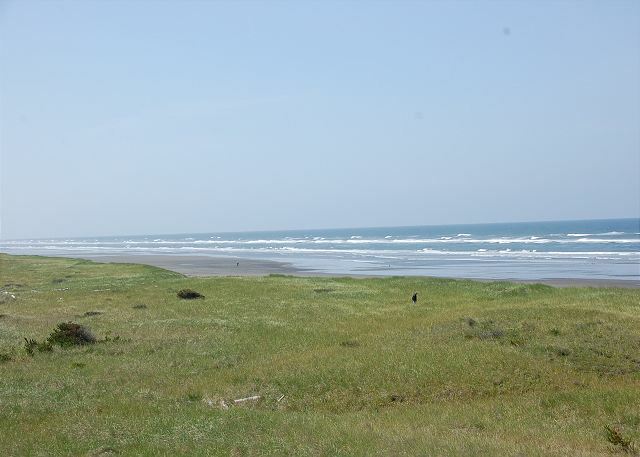 The access to the paved dunes trail was perfect, allowing for enjoyment of the surf without being out on the sand. Love this unit and plan to return. My week at Vacations by the Sea was just what I needed! The condo had everything needed, from a fully furnished kitchen to a big comfortable chair in front of a picture window looking out on the ocean rolling in just a few yards from my window. There were no obstructions to my view (as there are in Florida) and I loved just sitting there until I was "de-stressed", watching the ocean and sky change for my enjoyment. There is a beautiful club house with lots of books and movies , coffee and very helpful employees to help with anything you need.I really liked that Vacations by the Sea had on-site management in case you need it. The village is a nice place to spend an afternoon. Especially Half Moon Bay resturant . Vacations by the Sea is my favorite get away place when I just want to get away! Westport is a great place to visit and vacations by the sea is by far the best place to stay. We love visiting Vacations by the Sea. We were so fortunate on this visit--the weather was bright and sunny! The view from this unit is wonderful. And we are so grateful to the owners for sharing this beautiful property. This is a great place for families with children. The short walk to the beach allowed us to go back for lunch and sun breaks. The pool is heated for those cooler ocean days. We will defininately be back. Another wonderful stay at Vacations by the Sea!!! My mom, who lives in Eastern OR,had vacation with us for a week--we stayed in the condo for two nights and celebrated my birthday, her visiting us, AND Brian & I buying a brand new car--WHEW!!!! The condo stay was sooo restful & beautiful. Lovely corner unit; Mom loved staying in the master bedroom w/private bath--her first stay in a condo was fantastic! Thanks Brook & Jarl for another great memory! This was a family trip for a family of six to celebrate. The condo was very clean and enough space for all of us. The view from this condo is fabulous. We have stayed in multiple units and we will continue to come back to vacations by the sea in the future. This is our second year staying hear... far exceeded our expectations. Awesome condo.. amazing view... we will be back next summer!!! The weather was perfect!!! It was sunny during our entire stay. We had an absolutely gorgeous view. The condo was beautiful with all the comforts of home. We couldn't figure out how to make the DVD player work, so some instructions would have been helpful. I'd recommend this place to anyone without reservation. Thanks for staying with us at Vacations by the Sea! There should be a laminated instruction card near the DVD player, so we'll have to check on that and replace it. However, we do live on property, so feel free to call us if you have any problems with the equipment next time, we are happy to stop by and make sure everything is working! Beautiful 4th of July vacation! 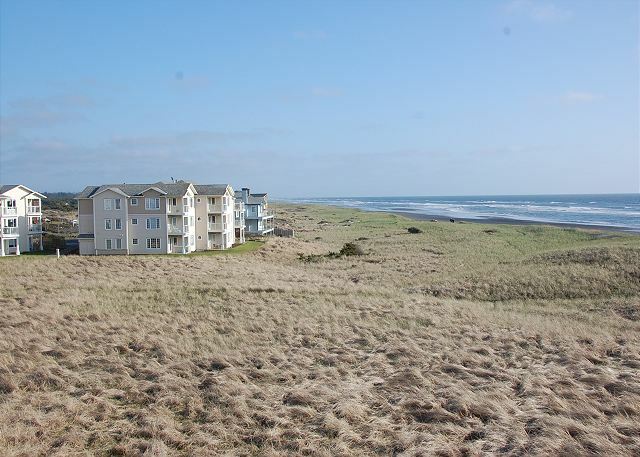 Our 2 bedroom condo rental was in a wonderful location, just a short walk from the Westport beach. The grounds of the complex are beautiful, including the pool, jacuzzi, putting green and 3 "doggy walk" areas. We brought our little dog and he just had a great time, too. We especially appreciated the elevator in our building, as we have issues getting up the 3 flights of stairs. The kitchen was incredible, with granite countertops, coffee maker, huge refrigerator, super clean stove, nice microwave, etc. The mattresses were comfortable, bathrooms clean, and it was a lovely place to stay. The view of the ocean is incredible! Fabulous time: great kitchen with all we could desire in it,great view, even a storm to watch! Very helpful office staff, we will most certainly be back! We had guests in town and not enough room in our house to accommodate all of them, so we rented this condo. It was excellent!! They were comfortable, we were comfortable, they got to enjoy the beach every day without having us shuffle them back and forth or play tour guide 24 hours a day. A great way to entertain guests in Westport. Furnishings and kitchen was good enough for them to make meals whenever they wanted (plenty of silverware/pots/utensils/etc for their party of 6). The kids LOVED the play area and pool. No complaints! They loved it, we loved it! Great time with family,and our dog,looking forward to our next visit. We're pleased you had such a Happy Birthday at the Beach with the family and dog, see you next time! A beautiful place that is fun for the whole family! We had a great time here on a short weekend vacation. I would recommend this to anyone looking for a local getaway. Thanks for staying with Vacations by the Sea! We're so happy that your family enjoyed your time with us and look forward to seeing you at the beach again soon! This was the third stay for my husband and I at Vacations by the Sea and as always we thoroughly enjoyed our visit. Trish was an absolute dream to work with and she made our trip extra special by making dinner reservations for us at Half Moon Bay New Year's Eve. We'll definitely be back soon. Thanks for staying with us again Lisa and we're very happy you and your husband had a wonderful New Years Eve with us and our friends at Half Moon Bay Bar & Grill. See you again soon. Loved the view from this unit. Got lucky with lots of sunshine. Our favorite spot on the PNW coast so far.